Boarding school is the oldest Islamic institution in Indonesia since the 13th century and still exists to this day. Boarding schools have a major role not only in terms of education, but also in terms of political, social, and cultural. This research included in the types of qualitative research phenomenological approach. Research data retrieved from the data source through in-depth interviews and then analyzed with model data analysis Miles and Huberman that is implement data reduction, data display, and conclusion drawing/verification. Researchers tested the validity of research data by using the technique of triangulation of sources. The results showed, Sayyid Hasan do boarding against his leadership cadre recruitment by means of formal and informal. Formally, the leadership cadre recruitment is done with the opportunity to give his students to participate in structural leadership of boarding school, participate in an organization outside of the boarding school, studied outside of boarding school Al-Iman in accordance with the interests of their respective students, and actively participate in the sub boarding units. As for informally, the leadership cadre recruitment is done with the method of awarding of exemplary and advice. Example and advice given repeatedly, especially related to the particularity of the nature of the leadership owned Sayyid Hasan. The nature of leadership which is owned by the idiosyncrasies of Sayyid Hasan include, the physical condition and mental healthy and strong, open towards students, and open with the public. Creswell, J. W. 2015. Penelitian Kualitatif & Desain Riset: Memilih Diantara Lima Pendekatan, Terj. Ahmad Lintang Lazuardi, Yogyakarta: Pustaka Pelajar. Efendi, N. 2015. Islamic Educational Leadership: Memahami Integrasi Konsep Kepemimpinan di Lembaga Pendidikan Islam, Yogyakarta:Kalimedia. Fakih, A. R dan Iip, W. 2001. 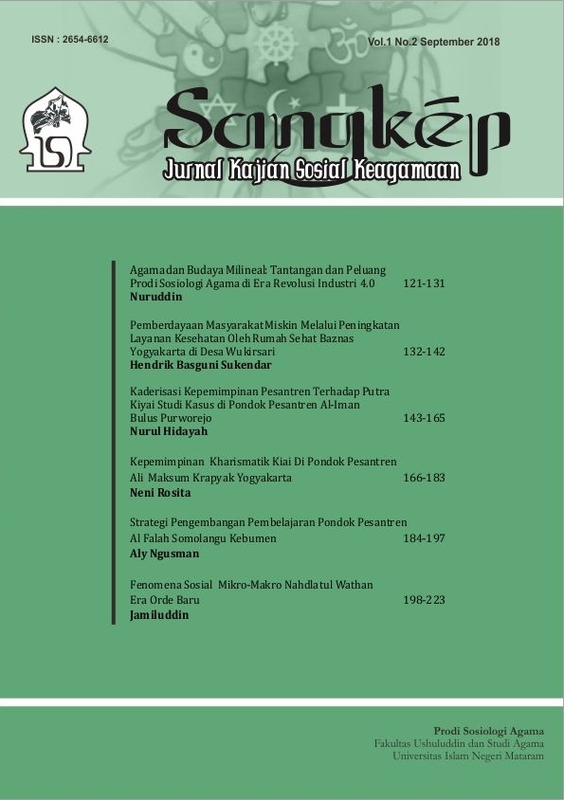 Kepemimpinan Islam, Yogyakarta: UII Press. Madjid, N. 1997. ,Bilik-Bilik Pesantren, Jakarta: Paramadina. Mochtar, A. 2009. Kitab Kuning & Tradisi Akademik Pesantren, Bekasi: Pustaka Isfahan. Moleong, L. J. 2017. Metodologi Penelitian Kualitatif, Cet. XXXVI, Bandung: PT Remaja Rosdakarya. Sastradipoera, K. 2005. Mencari Makna di Balik Penulisan Skripsi, Tesis, dan Disertasi, Bandung: Kappa-Sigma. Zainal, V.R., M.D. Hadad, dan M. Ramly. 2017. Kepemimpinan dan Perilaku Organisasi, Cet. XII, Depok: Rajagrafindo Persada.